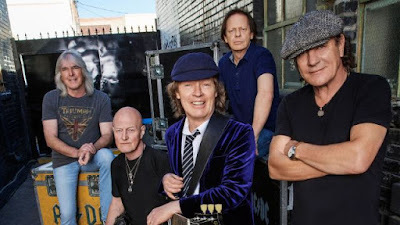 MetalRockNews: Jim Breuer about AC/DC: "I don't think Angus Young treated Brian Johnson well at all"
Jim Breuer about AC/DC: "I don't think Angus Young treated Brian Johnson well at all"
AC/DC frontman Brian Johnson's close friend, comedian Jim Breuer, says that the singer "came off classy" and the band's co-founding guitarist, Angus Young, "came off cold" when the announcement was made that AC/DC would reschedule shows without the vocalist. He was recently interviewed "Talk Toomey", saying: "As a fan, I will say I don't think he was treated well at all. At the end of the day, Brian is a huge, huge entity, and he is just [as much of] a part of AC/DC as the Young brothers, whether they wanna realize it or not. And as a fan, and I think I could speak for a lot of fans, it was a little awkward that, here's a man that's been with you for 36 years, he took you to a new stratosphere, he put you in the stratosphere. When you first heard 'Back In Black' and 'You Shook Me All Night Long', no one said, 'Wow, that Angus Young is amazing.' They went, 'Jesus! Who is this guy? How did this guy replace Bon Scott? How is this possible?' And to tour and to be part of that band, and after that long, you hear Brian's hearing is going and he can't really tour, me as a fan, and I think most fans, would think you'd see the band together in a press conference. And they would be all, like, 'We feel horrible for Brian here. We put so many years together. But Brian's gonna try to get help. And he's gonna come with us and introduce… And we're gonna look for a singer and we're gonna move on. But we all love Brian, and this is kind of a goodbye-to-Brian tour.' And to not see that and just read a headline that says 'We're replacing… looking for new singers,' and you don't hear anything from Brian until Axl is official… me personally, it's a little weird." He added that as a longtime fan who considers AC/DC to be his "all-time greatest band," he was "hurt… to watch just the way that was [handled]. I mean, you could have made a celebration. And it seemed like, at the end, when it was all said and done, Brian came off very classy, and Angus came off cold, like Walmart just replacing a cashier… like he's replacing a cashier. Which, again, that's right, but he needs to know his audience, and he needs to know how much love, time, investment and money we put into Brian Johnson. And he is a huge, huge voice and part of AC/DC and rock and roll, period."